Evgeni Plushenko, the most decorated figure skater of the century, talked to HealthyLivinG Magazine from Olympic Sochi shortly after his dramatic withdrawal from the individual competition to the standing silence of his adoring fans who had filled up the Iceberg Skating Palace arena only to cheer him on his way to the judges’ board where he declared the resignation the very minute the music to his short program was about to start playing. Read: Evgeni Plushenko Withdrew "I didn't feel my legs after the 2nd triple axel"
“This is the strangest night I have seen in my 20 years in figure skating,” his foe/admirer Evan Lysacek commented for NBC. 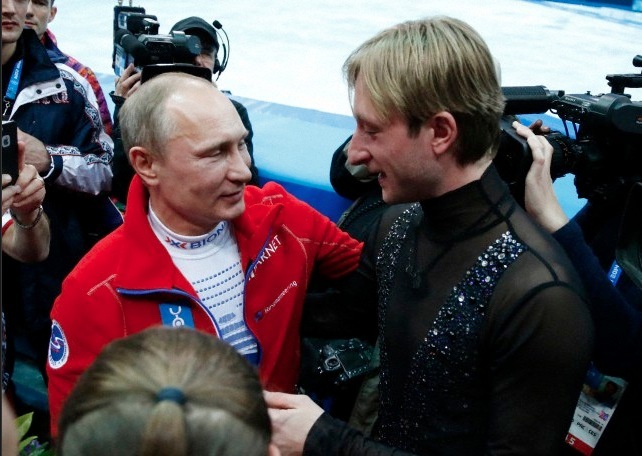 This exclusive interview was initially scheduled after Plushenko’s much anticipated free skate would conclude the competition—but things took an unexpected turn after Evgeni announced his retirement from amateur sport. For the third time. "After finishing the free program in the team event I felt back pain and said that with this trauma I could be replaced... it was said that Maxim [Kovtun, Russian Nationals champion] got sick and couldn’t come to Sochi. So I was forced to skate further." HealthyLivinG Magazine: We have received a lot of questions from the readers about your health; please tell us about it. Evgeni Plushenko: I had a sharp pain in the area of my recent back surgery during the warm-up [to the short program], so I could not skate and had to withdraw from competing. Several injections and procedures have been done since and I feel much better now. I will be heading to visit Dr Pekarsky in Israel who performed the surgery to do imagery diagnostics and figure out what happened, hoping to recover within a month to begin training and start skating again. HealthyLivinG Magazine: Are you still planning to go on tour? Evgeni Plushenko: I don’t think currently about my tour, which was planned half a year ago. I am focusing on treatment and, should everything be fine, I will be touring. HealthyLivinG Magazine: Will we ever see your quadruple jump again? 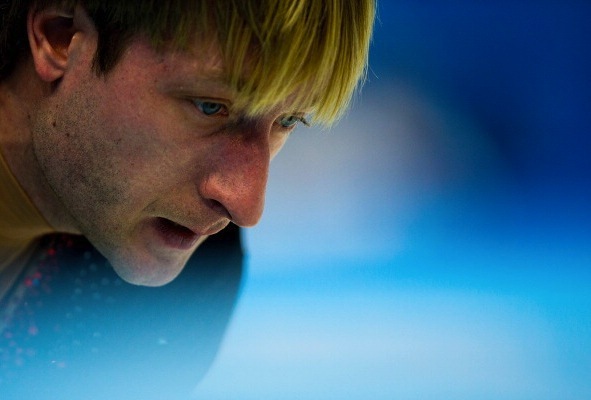 Evgeni Plushenko: I don’t know if I will compete again but for exhibitions I don’t need a quad. I am planning to produce sophisticated programs with 3.5 axel and many other triple jumps but don’t really know now about the quad. HealthyLivinG Magazine: Strangely enough, the US sport community showed a much more balanced reaction to your withdrawal with even your bitter rivals praising your achievements. It is Russia where some quite brutal comments were heard and picked up by the Western press. Evgeni Plushenko: I fully agree with you. I did not expect such a reaction, but I feel it is a small number of people compared to those who support me and understand what I have done for figure skating. They understand that a year ago I could hardly walk and had to learn skating and jumping anew. This is how our people are. But in truth there aren’t that many and they do not deserve attention. People with wrong, negative approaches can be found in any country; the majority praises the fact that I earned one more gold medal in the team event. I am receiving an enormous amount of positive tweets, texts and letters. For me of highest importance is that our President Vladimir Vladimirovich Putin said that I have done everything possible and thanked me. Very important also that Minister of Sport Vitaly Mutko said everything was great. People need to understand that an athlete is also a human and before saying negative things one must put themselves in his shoes, consider his long career in the sport and, in my case, going through 12 surgeries. HealthyLivinG Magazine: What do you think happened to the lead skaters in the free program after you left? Evgeni Plushenko: You better ask them. Maybe too much excitement or anticipation of a win. All three medalists are very strong athletes—Yuzuru Hanyu, Patrick Chan and Denis Ten showed the highest class all season; they are the future of figure skating. I deem Yuzuru to be a genius with a very bright future. Being only 19, he may skate in many Olympics and win them. Patrick Chan is a master of the blade, a very good athlete. Flinched and got a little nervous, I’d say. HealthyLivinG Magazine: Was it your stimulating company that kept them from falling before? Evgeni Plushenko: I have noticed that when I compete everybody competes against me and, when I do not, they compete with each other. On all the tournaments I skated, somehow guys skated at a very high level; they didn’t make such mistakes. With my leaving the sport guys thought they should be fighting each other because they all are of approximately the same level, instead of doing the job of which they are capable. HealthyLivinG Magazine: There were signs of an exciting future for the sport—skaters such as Kevin Reynolds doing three quads in a program. Evgeni Plushenko: I am very grateful to those athletes who, after the Vancouver [Olympic Games], started to jump quads and included several [in their programs]; if we recall Vancouver, I alone did quads in both the short and free programs. It is very important to me that figure skating moves forward specifically in quadruple jumps. HealthyLivinG Magazine: What is next in figure skating? Evgeni Plushenko: After some time they’ll learn all of the quadruple jumps; five quads in a program will become the norm, and it will be a real thing, true figure skating, as figure skating is not only an art, a ballet, not only beautiful skating; first of all, it is a sport; that’s why men’s figure skating must include quadruple jumps. HealthyLivinG Magazine: Are you saying that the human limit is a quadruple axel? 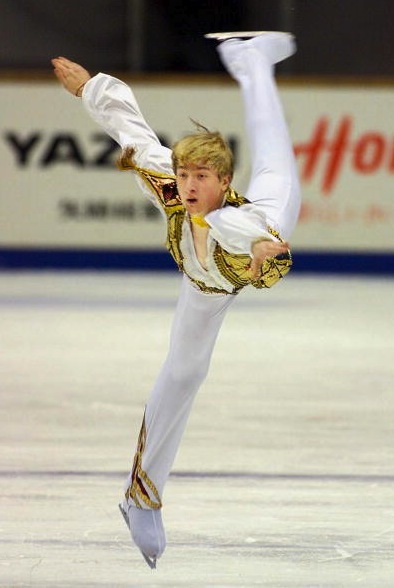 Evgeni Plushenko: I think there are no limits in sports. They always move forward. First, the athletes will learn all quads, then 4.5 quads, and in some 50-70 years there will be a quintuple jump, I’m sure. Maybe in 100 years, but it will happen. There will be combinations of two quads. I know because I was training a 4.5 axel and two toe loop quad combination. If I jumped it, I think guys will jump it too—after some time maybe. There will be different athletes, different gear, lighter boots and blades. One hundred years ago folks used to jump a single jump; now a quad is a norm. Just give it time. HealthyLivinG Magazine: And spine disks—will they will be lighter too? Evgeni Plushenko: [chuckles] Well, medicine moves forward too, so lighter spine disks are a possibility. I am looking at my son, how fast his development is—running around and speaking at only one-years old—and understand that these new people who are being born now are already different from us; and all of that, including quads, faster spins, will be a new normal for them. Though there will be injuries and surgeries still. HealthyLivinG Magazine: After you retire Maxim Kovtun becomes the front line of the Russian men’s team. How can you help him? What do you have to say to him? 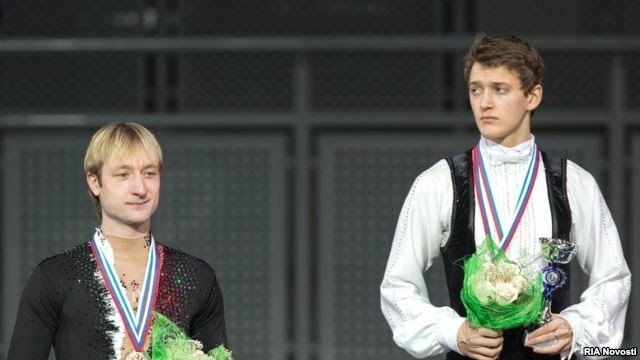 Evgeni Plushenko: Everybody is obsessing with Maxim Kovtun, but there are also Sergei Voronov and Konstantin Menshov. We have a system in Russian figure skating in which the selection is based not only on nationals but on the European Championship as well in which Maxim took only fifth place. Sergei Voronov was second and Konstantin Menshov came third. So some very good prospective athletes are staying. A youth no less worthy than Maxim Kovtun stays, too. The story with Maxim is just inflated. I respect him very much, good fellow, good athlete. But people keep asking why he wasn’t picked for the Olympics. Well, suppose he would have participated—he would have taken ninth or tenth place and that wouldn’t have been good for his career. Maxim is not ready yet for big competitions. Yes, he wasn’t all that bad in the Russian nationals but his performance wasn’t a masterpiece like the others—Patrick Chan, Denis Ten and Brian Joubert—these are great athletes. Maxim needs to focus, train and prepare for the next season—for the World Championships, provided he will pass the selection process. Last year Maxim was 15th or 17th in the World Championships, which is why we had only one opening for the Olympic Games. After finishing the free program in the team event I felt back pain and said that with this trauma I could be replaced. But when they tried to reach Maxim they couldn’t find him. HealthyLivinG Magazine: When exactly did this happen? Evgeni Plushenko: Right after the free program in the team event. Later it was said that Maxim got sick and couldn’t come to Sochi. So I was forced to skate further. HealthyLivinG Magazine: Many athletes in the Soviet Union, even after reaching elite levels in their sport, were destined to misery upon retirement. You are perceived here in the US as royalty, belonging to the highest circles of the modern Russia. Do you have any plans on using your powers and influence to improve the situation with retired athletes struggling in Russia today? 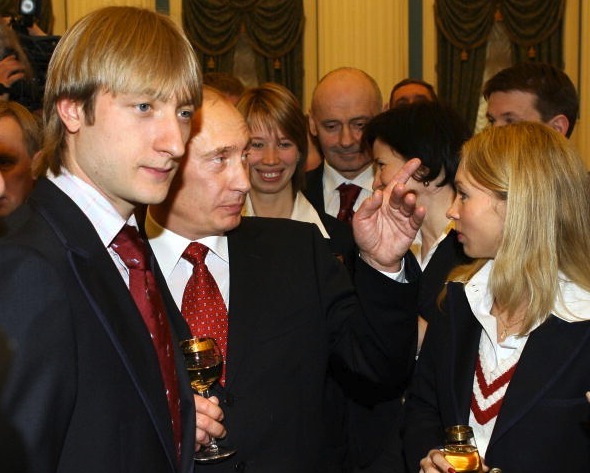 Evgeni Plushenko: This is politics and I do not get involved. We have government officials, select officials who know the laws and think about the country. They will better answer this question. But, generally, life conditions are becoming better, not for everyone of course. Let’s just look forward and everything will be all right. I don’t want to even touch this, as this is politics. My life is figure skating, sport, and I will do everything in it—raise athletes, create champions, open my skating school—as I have vast experience. I think those who retire should be offered some good terms. I think it all is ahead and will be done. HealthyLivinG Magazine: HL readers have been asking whether you have any plans in business. Evgeni Plushenko: Many ideas, very big ones that everybody will hear about. We are doing a very serious project I would not want to reveal yet—but within a year or so you will hear of it. HealthyLivinG Magazine: What are your plans to fulfill your artistic potential? Evgeni Plushenko: I spent so much time doing figure skating so do not exclude that I will be training young athletes. I will be touring the world and have an idea to open a figure skating school. HealthyLivinG Magazine: What is the price for high achievement in figure skating? Evgeni Plushenko: Big sport is not fitness class. While I do know some athletes who are competing without having surgery yet, in big sports it’s very rare that a high achieving athlete does not experience injuries and surgeries; parents must be aware of the physical endurance involved and fact that injuries are not excluded. HealthyLivinG Magazine: Tell us what a child athlete should expect to go through? 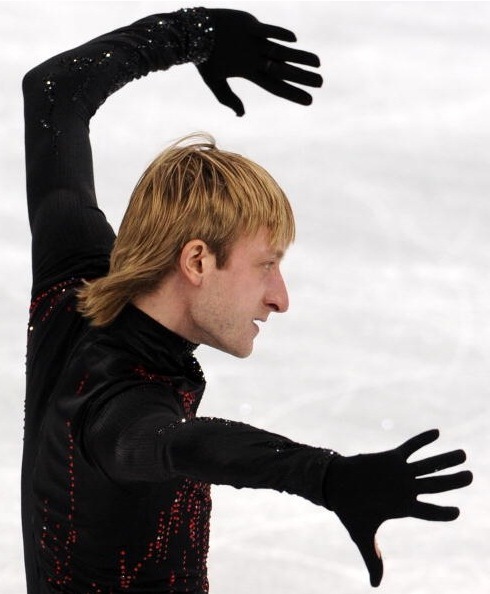 Evgeni Plushenko: Sports achievement involves complex training with a strong emotional component: multiple trainings a day not only on ice but general physical enhancement including running, gym, special exercises, choreography, stretching and dedication—having nothing in life but the sport—constantly regimented and disciplined. If we are talking about a professional athlete, it is pretty much living for the sport alone. HealthyLivinG Magazine: Is it worth it? Evgeni Plushenko: It’s a matter of a personal choice. I do not regret my life. I rejoice and take pride in my very long run in figure skating and being in the arena since I was 13. HealthyLivinG Magazine: Not everyone is as gifted—most won’t climb that high, despite the effort. Evgeni Plushenko: It’s the fate of God; of course, not everyone will be an Olympic champion but one needs to work hard and fight for it. HealthyLivinG Magazine: You wouldn’t mind should your children choose it? Evgeni Plushenko: To win Olympic Games? HealthyLivinG Magazine: To pay the price. Evgeni Plushenko: Both my sons will be athletes, maybe not in figure skating though because I want to get to know new sports and live it through with them: soccer, hockey, golf, tennis, definitely not figure skating as we have enough skaters for one family; we need to move forward. I would like to dedicate my life to my kids, live through new sports with them and try to grow them into champions. If they face a life like mine with injuries so be it. I will support them. The reason why I had so many injuries and surgeries is that in my time we had no doctors, rehabilitation or proper understanding of these issues. We only trained hard and had no rehabilitation whatsoever. Now I see it all and if my kids will have doctors, rehab programs, massages, saunas, pools, they can have a very long career in sports and minimize the traumas. HealthyLivinG Magazine: I suppose athletes from developed countries might have had better conditions but none lived in sport as a top achiever as long as you. Evgeni Plushenko: I don’t really know their conditions. Today we have everything. I am very pleased how the sport ministry takes care of us these days: we have doctors, rehab programs, pools—everything we need. Unfortunately, this wasn’t the case for most of the time I trained. If I had these earlier, many of my injuries and surgeries would have been prevented. HealthyLivinG Magazine: Did the new team competition somehow change the dynamics within the Russian squad? Evgeni Plushenko: Not really. Communications within the team have always been great, no intrigues; everything is fine and respectful. By the way I am grateful to all the athletes who skated with me—Americans, Canadians, Japanese—who all came up to me and said I’ve done a lot for figure skating, that I am their idol and it was an honor to skate with me. For me it was very important, and I was delighted. HealthyLivinG Magazine: Do you have plans for those athletes? Evgeni Plushenko: Yes, I have plans and offers and I will consider them. I am open to communication and I have a scheme how to prepare those athletes. Of course I have. Gold and silver medalists each failed two jumps in their free program. Maxim Kovtun wasn’t picked by the Russian Figure Skating Federation to represent the country despite winning over Plushenko in the Russian nationals on December 27, 2013. The decision created controversy and criticism inside and outside Russia.